India-based Log 9 Materials is working on graphene-based metal-air batteries, that in theory may even lead to electric vehicles that run on water. The metal air batteries use a metal as anode, air (oxygen) as cathode and water as an electrolyte. A graphene rod is used in the air cathode of the batteries. Since Oxygen has to be used as the cathode, the cathode material has to be porous to let the air pass, a property in which graphene excels. According to Akshay Singhal, co-founder of Log 9 Materials, the graphene used in the electrode is able to increase the battery efficiency by five times at one-third the cost. The Company explains that the most immediate advantage of such a battery would be the eliminated need to recharge. Instead of the lithium-ion batteries that power most of the EVs (and gadgets), the metal-air batteries by Log 9 do not require any charging and instead, run on a refueling mechanism that only required water as the fuel. So every hundred kilometers. On a global level, this would again reduce the dependence upon the limited elements such as Cobalt which are used majorly in the making of lithium ion batteries. It would also eliminate the need for huge investments in charging stations and other related infrastructure. This also means less electricity requirement, which is again mostly generated through fossil fuels at the moment. 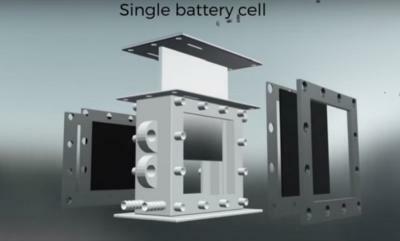 However, the idea of using metal-air batteries for electric vehicles and other applications is not new or unique to Log 9. Several companies have been working towards it and many others have shown interest in the concept, including Tesla, that currently rules the electric vehicle market share. There are, however, several challenges that restrict the adoption of such batteries in vehicles. A major one of them is the irreversible loss in battery performance through corrosion. As per Kartik Hajela (Co-Founder), Log 9 is relying upon the material competency to prevent corrosion in the prone parts. The firm also has an IP generated around the process. Hajela also mentioned how the team faced difficulties in driving power out of the batteries. Despite this, however, the team has managed to increase the power per cell by 4 to 5 times. Kartik mentions that the metal-air batteries and their product development cycle are currently being optimised to make them feasible for the market. The POC has been done for the same. The company aims to launch the product by 2020 for stationary purposes and begin the commercial prototyping around the same time for mobility applications. He says the cost of the said batteries would be “on par or cheaper” with the current batteries. This is a prediction though, based on the raw materials and process of making it. The cost will be cut down (if so) through the use of graphene. To date, Log 9 Materials has already come up with a range of graphene-based products like Log 9 Oil sorbent, a filtration media and a Post-Purification Filter (PPuF) for smokers. Through these innovations, it has managed to garner seed investment from GEMS Micro-VC Fund and a pre-series A investment by various firms.